This week, I plan on showing you some samples from a new stamp set coming in June. Daisy Delight. It really is a delightful stamp set. A Daisy is typically white, with a yellow centre...but with this stamp set, and the co-ordinating punch...you could cultivate your own beautiful flower, like this one for instance. Don't you love the centre of the flower....its so real looking. 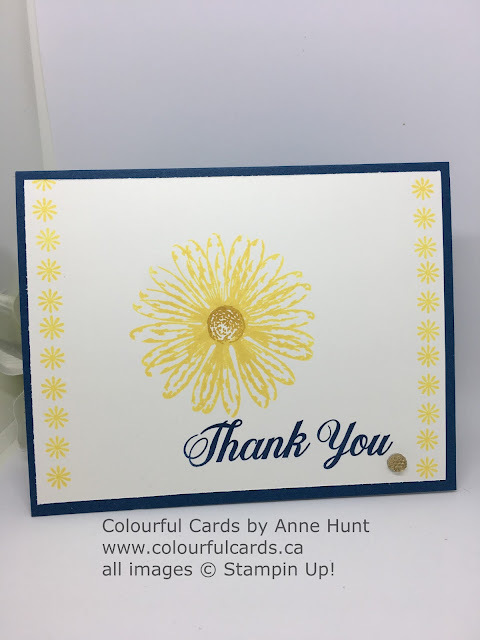 I used Dapper Denim card stock for the base, and Whisper White card stock for the stamping. The sentiment is also from Daisy Delight...the font is so nice. You might notice a lovely little new embellishment in the bottom right hand corner too. 😀 Look in on Wednesday for another sample....have a great week!